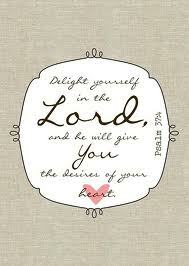 Let’s take a look this week at the word delight. The Hebrew meaning for the word delight literally means to be delicate or feminine. It carries the idea of being pliable or sensitive. In this particular verse context, it means to be pliable and sensitive to being dependent on God and deriving pleasure from Him – to treasure Him. Does this describe me ? Do I bend easily and remain flexible to what God wants me to do? As the word pliable describes a piece of leather that doesn’t crack, do I exhibit this character when I feel like situations are not as they should be? Does the source of my happiness and joy come from delighting myself in God alone, or someone/something else? Do my day to day priorities reflect that I am obeying this command…this command to delight myself in the Lord? Would you agree that if you are not intentional about delighting yourself in the Lord, the many things of this world (some very good) can become a distraction? Things like family, friends, home, work, fun and responsibilities. Often there can be found such personal gratification in participating in these things, they become our priorities and our idolatry. They can easily cloud our vision from seeing the real priority needed in our life – to treasure a close daily relationship with the Lord. Psalm 42:1-2 “As the deer pants for streams of water, so my soul pants for you , O Gd. My soul thirsts for the living God. When can I go and meet with God? This doesn’t mean that we have a blank check for God to simply give us whatever our heart desires – that would simply promote our idolatry. No, the promise here is that if we are relying on God – delighting in Him and deriving our primary pleasure in Him, then He is our desire and we get Him! He will also cause all our desires and wants to line up with His will for our life. How are you going to choose to live this week? What idols distract you from delighting yourself in the Lord? What sacrifices do you need to make to treasure God in your everyday life? What do you need to rearrange in your schedule so that you can thirst for His presence, spend time dwelling with Him, gaze on His beauty and earnestly seek Him with all your heart? Wishing you a week of taking great delight in your Great Sovereign Redeemer and Restorer! Pastor Lewis used to refer to.me as an early Christian like a kid in a candy store. I miss the candy store so to speak. I used to be so aware of God in the little details of life. It brought great joy and delight. I am praying to Jesus to rekindle THAT kind of relationship. It is so true how we unwittingly will setup idols as innocently as family, school activities, etc. to fill our day. But does it fill us with the fullness of Christ. I shared this with several girlfriends. Just the definition of delight took me by surprise!